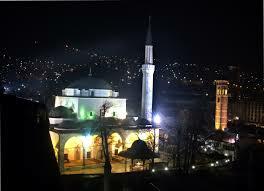 A traditional Christmas concert was held last night at the Bosnian National Theater in Zenica. The performers of the concert were the members of the Chamber symphonic orchestra and the choir from Zenica but also many artists and groups from Žepče and Novi Travnik. Benisa Đidić opened the concert with her performance of ”Ave Maria” by F. Schubert. The performance of the song ”The lion sleeps tonight” by the Vocal ensemble ”Bel Canto” from Zenica was the highlight of the concert. Don Ante Ledić, the director of the Catholic School Center St. Paul in Zenica also attended the concert and used this opportunity to wish a merry Christmas and happy New Year. Children’s choir of the Catholic School Center St. Paul from Zenica performed the song ”Jingle bells” for the closing session of the traditional Christmas concert.